It’s so easy to start a workout program. You buy the equipment, you’re jazzed to make changes in your life, you post a picture on your social media declaring your new lifestyle. And then one day, you look around, and you realize that beautiful piece of exercise equipment has somehow turned into a place you hang dry your laundry. Whoops. How did that happen? The thing is, it’s so easy to start something, but the real challenge is in making it a consistent habit. Our brain forms habits quicker if it receives an immediate reward, which isn’t always the case with exercise. According to a study published in the European Journal of Social Psychology, on average, a person needs 66 days to form a habit. While the time it takes widely varies from person to person, it’s no wonder that’s it’s easy to get discouraged about your workout when it can take two months for your brain to get with the program! One of our goals with Tonal was to create something that wouldn’t just get you started on a workout program, but would keep you coming back for more – and prevent it from becoming another clothing rack. Here’s how to use Tonal to make consistent exercise a habit. Pick a Coach Who’s Good For You: When you find someone you vibe with you’re way more likely to want to work with them. You’ve got limited time to workout, so spend it with someone who motivates you and coaches to your goals. If you need help, check out our tips for choosing a Tonal Coach. Remember, every olympic and professional athlete has a Coach backing them up, telling them what to do. 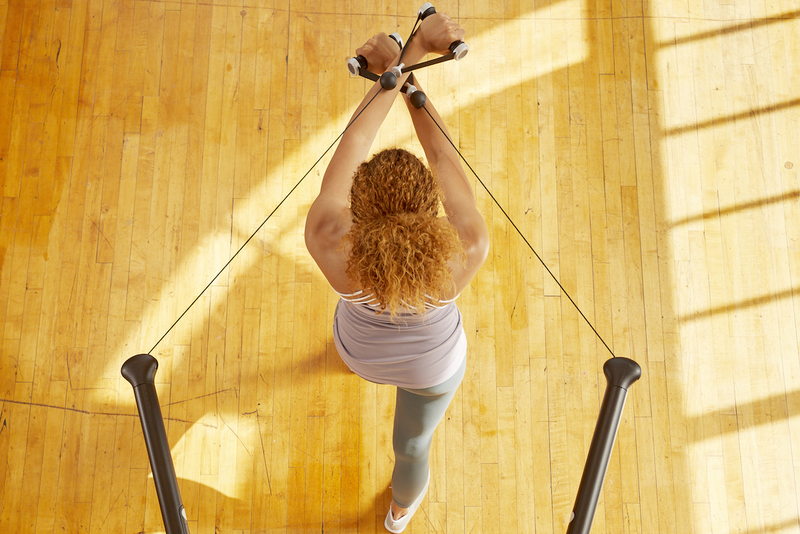 Tonal Coaches take the guesswork out of exercise and know how to guide you to your goal. Same Time, Same Channel: One way to make exercise into a habit is to link it to another activity you already do consistently at the same time; for instance, turning on your coffee machine and letting it brew while you work out, or immediately changing into exercise clothes after getting home from work. If you’re working toward making exercise a habit, select one of our programs instead of picking a different workout every time you power up Tonal. This will help make your workout even more automatic, since you don’t have to spend time deliberating which workout to do. Pick a time that works for you and keep that date with yourself! Bump Those Beats: There’s a reason why gyms always have music going in the background; music pushes us to be more energized and motivated during our workouts. Tonal gives you a huge selection of music to keep you jamming through your workouts, while still allowing you to hear coaching cues. Repetition Equals Results: Repeating an exercise creates muscle memory, which isn’t really a memory that your muscle has, but are actually changes that occur in your brain that alter the information sent to your muscles. Repetition of a skill “increases the connections between the different areas of the brain that are required for a particular skill” according to a publication by Oxford University. Tonal programs are designed not just to have you do an exercise once, but to come back and practice it several weeks in a row. Repeating a movement helps your body master an exercise, which means more neural and muscle recruitment, which means you’ll get more out of each exercise and make more progress. Make Big Plans, Take Small Steps: At Tonal, we want you to have big goals that inspire you to push yourself during your workout and in your daily life. Any big thing you want in life can seem overwhelming at first glance but if you consistently take small actions to move toward it, you will absolutely reach it. Think of every workout as one more step toward your goal. Log your Progress: Tonal will log your weights, reps, and sets so you can track your progress seamlessly. There are also so many other ways you can see how far you’ve come too – notice how your energy levels and sleep improve, how your clothes fit, or even how much easier it is to carry groceries from your car. These are all signs that you’re getting stronger, and the more you notice, the more motivated you’ll be to continue working out. We know you want results, not another place to hang dry your clothes. We want you to succeed and the first step to your future achievements is showing up.